Prepare for a Career in TEXTILES with Confidence! Sara Kadolph’s Textiles provides students with a comprehensive, basic knowledge of textiles. This beautiful book, filled with full-color photos and illustrations, examines the interrelationships among fibers, yarns, fabrics, and finishes and discusses how they impact product performance. Organized according to the textile production process, the text gives students a solid understanding of textile components and how they work together. New activities and case studies bring the text to life and facilitate group activities. A timeless resource for any professional in the industry, the Twelfth Edition has been updated to discuss sustainability, technological advances, and new career opportunities in the textile industry. Sara J. Kadolph is a retired professor emeritus of Apparel, Merchandising, and Design at Iowa State University in Ames, Iowa, where she taught for 30 years. She taught several courses related to textiles: chemistry, dyeing, quality assurance, and conservation. Dr. Kadolph is the recipient of numerous teaching, advising, and professional awards including teaching excellence awards from the International Textiles and Apparel Association, Iowa State University, and the Iowa Association of Family and Consumer Sciences. She was the inaugural holder of the Donna R. Danielson Professorship in Textiles and Clothing. She is a Fellow of the International Textiles and Apparel Association and a Wakonse Fellow. Dr. Kadolph has consulted with companies in the textile complex to solve quality problems, educate product development/design teams, select materials, assess textile performance, write specifications, and develop quality assurance programs. Her teaching and research scholarship has been published in the Clothing and Textiles Research Journal, the Journal of the Society of International Natural Dyeing, the Journal of the Korean Society for Clothing Industry, The Journal of Consumer Education, the Journal of Family and Consumer Sciences, the International Journal of Clothing and Science Technology, and others. 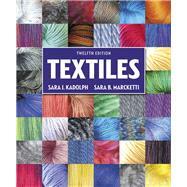 Her Textiles book with Pearson Education is used in colleges and universities throughout the world. Sara B. Marcketti is an Associate Professor in the Apparel, Merchandising, and Design Program and Associate Director of the Center for Excellence in Learning and Teaching at Iowa State University. She teaches courses in textile science, history of dress, and creative thinking and problem solving. Dr. Marcketti is the recipient of numerous teaching, research, and professional awards including teaching excellence awards from the International Textiles and Apparel Association, Iowa State University, and the Costume Society of America. She was a member of the Costume Society of America’s Scholars’ Roundtable and a Wakonse Fellow. Dr. Marcketti’s teaching and research scholarship has been published in the Clothing and Textiles Research Journal, Dress, Textile History, the Journal of Family and Consumer Sciences, and others. She is the co-author, with Phyllis Tortora, of Survey of Historic Costume, 6th edition.